Christmas is always a special time at Waddesdon, and 2017 is no exception. As always at Waddesdon beautiful decorations in the House, events, food and gifts come together in a seasonal celebration not to be missed. From dusk there will be a light show on the front of the house too, bathing the ornate façade in rainbow colours, while the two giant candlestick sculptures, Lafite, by artist Joana Vasconcelos, will also be illuminated. 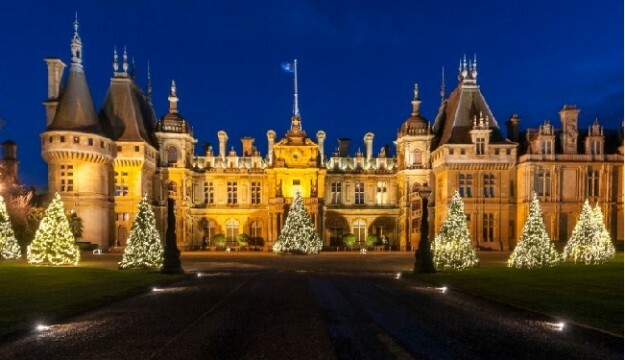 Festive shopping will once again feature at Waddesdon this Christmas. From the well-stocked and beautifully decorated Manor Shop to the Wine Shop, the perfect place to pick up a delicious Rothschild wine. In addition there will be a two seasonal pop-up shops at the Stables, one continuing the winter light theme and another with a more traditional offering. Our Christmas Fair, located on the North Front of the House, with the illuminated house as its backdrop, will this year feature over 60 exhibitors across four weeks (starting 15 November). With the ‘cream’ of local artisan producers alongside some of the best loved independent traders from around the country, the fair will offer visitors a great selection of unusual Christmas gifts and festive foods. Christmas at Waddesdon 11 November-2 January, 11am-6pm, Wednesdays to Sundays and additionally Monday 1 January. Closed 24-26 December. Christmas Fair 15 November-10 December, 11am-6pm, Wednesday to Sundays.